Macro markets are mixed this morning as the U.S. Senate passes a two-year year budget deal and raises the debt ceiling until March of 2017. From what I understand, President Obama is expected to soon sign the bill into law. Also overnight, the Bank of Japan elected to leave monetary policy “unchanged”, but lowered their growth and inflation targets. Keep in mind yesterday’s data showed U.S. GDP growth falling by more than expected, from +3.9% the previous quarter, to just +1.5% in yesterdays reading. Even though the odds inside the trade have risen as of late in regard to the U.S. Federal Reserve making it’s first rate hike in December, now slightly over 50/50. Personally I don’t think they will make a move, especially with growth in the U.S. economy pulling back. Even Starbucks announced yesterday that they were dialing back their earnings expectations in the quarter ahead. The bulls continue to argue: the U.S. employment landscape might be weakening a bit, but there’s still many sectors that are hiring aggressively; the U.S. housing market is definitely on more stable footing; U.S. Businesses appear to have more cash on hand than in years past; U.S. Consumers have been able to improve their balance sheet with less debt, low interest rates and much lower fuel prices. Hence the bulls see no sign of a recession or reason for major economic fear. Bears on the other hand like to reiterate, “the view always seems the best while near the top.” The strength of the U.S. dollar and the negative repercussions that may continue for the emerging markets is reason enough for me to believe the underlying landscape is NOT nearly as promising as it looked 6-12 months ago. There’s also the fear associated with what could be much larger fallout from the energy sector. Once again, the energy sector is a portion of the investment landscape that looked much more positive and stable 12 months ago. It’s not that things are economically horrible here in the U.S., because they absolutely are not. It’s just that the overall landscape has shifted and changed enough to warrant greater cause for concern, especially as the stock market is about to post its largest monthly gain in four-years. Keep in mind, the S&P 500 has only posted monthly gains of +8% or greater twelve times in its entire history. I’m just not sure this one of those rah rah moments. Think about it like this… 12-months ago we were able to take a majority of our investment shots form inside the paint, everything seemed easy. Today’s market has become much more difficult, forcing investors to take more shots from beyond the three-point line. For me, at this point in my life and my career, that’s just not my game. I prefer to walk the ball down the court and feed it inside for the higher-percentage type shots. For that reason I continue to like the thought of being highly selective and extremely liquid in this environment. Weather in the Corn Belt will see a return of warm weather, maintaining a rapid corn and soybean harvest pace. Across the Plains, mostly dry weather and record-setting heat prevails in advance of an approaching storm. Rain looks to increase substantially across the Plains hard red wheat belt today through Friday, improving crop establishment in all areas. Midwest corn and soybean harvest will only see minor delays from light rains this coming weekend. Despite the light coverage, Midwest wheat should still derive some benefit. Delta rains late this week and early next week will only impact the very late cotton/soybean harvest, while improving germination conditions. In the South, dry weather throughout the region favors autumn fieldwork, although worsening drought from the Mississippi Delta westward contrasts with post-flood recovery in the Carolinas and environs. Overall, rainfall will be confined to the southwestern and south-central U.S.. Five-day rainfall totals could reach 2 to 5 inches in Oklahoma, Texas and parts of neighboring states. Across the northern Plains and upper Midwest, late-week rainfall could exceed an inch in some locations. Meanwhile, mild, dry weather will prevail in the West and Southeast. 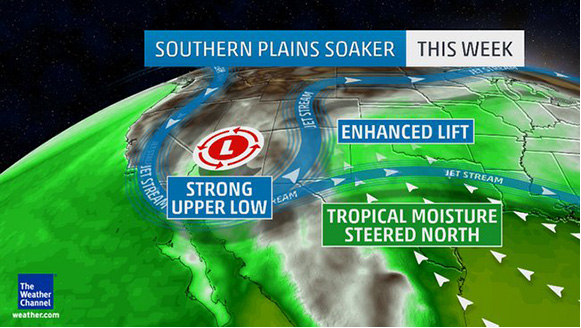 Heavy Rains and Flooding On The Way for Southern Plains: Persistent southeasterly winds will pump moisture from the Gulf of Mexico into the southern High Plains. This will contribute heavy rains as far west as eastern New Mexico, western Texas and western Oklahoma by Wednesday night and Thursday. This rain is then expected to spread across the rest of Texas, Oklahoma and possibly parts of Louisiana and Arkansas by Thursday night or Friday. In addition, moisture and energy from Tropical Depression Twenty-E in the eastern Pacific could be involved in this setup. Forecast models are showing that after it makes landfall in Mexico it will get pulled northeastward into the south-central states.